But I felt flummoxed about my response. Shouldn’t I tell her it’s not a great idea to draw on walls? What if she drew on someone else’s wall, like one of her grandmother’s? What if she thinks it’s okay to draw on her pre-school wall and the teachers yell at her and then call me up and yell at me? What if she draws on the walls when she’s at a play date? I come up against this question of when to put on the tough parent act a lot. I had dogs for years before I had kids, and I always imagined that parenting would be somewhat similar to dog training. “No! Bad kid!” Or “Lila, come!” You give them treats when they do what you want and you ignore them when they don’t. Not so easy. (And I’m certainly not claiming that I was a dog whisperer either.) By the way, George, though a therapy dog, is actually not that well-trained, or else he has lost some of his training. Or perhaps his training has holes in it. Like for example, he doesn’t come when he’s called. Also, when you take him out, he pulls and yanks and sniffs and growls at other dogs. He does sit, give you his paw and lie down for short periods of time, but then again, so did every dog I ever had. But he is really nice and as I have said before, his very presence seems to lower our blood pressure. And he is an excellent listener. He plays his role as family therapist with much humility and grace. Tonight, Lila and I were coloring together before the writers came over for our writing group. Lila and I were making a card for her grandparents, thanking them for their hospitality over the weekend in Virginia. We had spent Saturday outdoors in the beautiful new spring, with the forsythia glowing like torches in the midday sun. My mother and Lila were planting sunflower seeds and my father was pruning a butterfly bush. I was nursing Johnny and letting him crawl around, trying to prevent him from eating too much dirt. Johnny is so delicious right now that I swoon whenever I see or smell him. He put his chubby little arm around my neck and with his other hand picked up the mother-of-pearl on my necklace and put it in his mouth. I had sniffed his head and taken in the whole glorious moment. There is nothing I love more than watching my parents interact with my kids. Anyway, we were drawing together tonight, Lila and I. 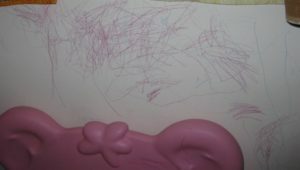 She was asking me when she could draw with Sharpies like Mama as opposed to the washable Crayola markers she was using. “When you’re a big girl,” I said. We kept drawing quietly. As with George’s presence, the act of drawing and coloring calms me down more predictably than almost anything else. I have been thinking a lot lately of the Brama Viharas. They are: loving-kindness, compassion, sympathetic joy and equanimity. These days, like never before, I view them as worthy ideals–perhaps the most worthy ideals–to strive for. When I was a little girl, I had a grandmother (Lila’s namesake) who never, ever lost her temper. She was a walking demonstration of the Brama Viharas. People called her a saint. Every morning, I would wake up and think, “Today I am going to be like Grandmother. Today I will be nice no matter what! I will not lose my temper or be mean to Katryna!” and by 10am I would find myself in a fist fight with my sister, or a grouchfest where I was off somewhere sulking. Why was it so hard to be like Grandmother? Over time, it became easier to be nice, and I’m sure in my thirties–my single thirties–I blew through many days being a calm, loving/kind, sympathetically joyful compassionate person. It’s not so hard when most of your relationships take place on the phone or on-line. But try sharing refrigerator space (or yogurt) or attention from the various family members (like your husband), and pretty soon, my teetering toehold on the mountain of enlightenment slips and tumbles before I am even aware I am falling. 1. Be well rested. You are almost doomed to parent poorly when you are too tired. 2. Don’t try to get the kid on your schedule. If you schedule yourself too tightly, you are asking for disaster. 3. Your kid needs to use you as if you are his or her nervous system. His/her own nervous system is too immature to regulate itself, so you are it. Therefore, when your kid is really wired and up, even in a cute, fun, great way, balance it out with mellowness. And likewise, if your child is down, that’s the time to pick up the energy, have a kiss-fest, send in the clowns. 4. If your kid really loses it, empathize. Say, “You seem so sad/angry. I know this must be very hard. I am here.” And put your arms around the child and hold him/her. 5. Tantrums are totally natural and normal and most kids have them at this stage. Your kid is not a tantrumming kid. Your kid is a kid. Period. Treat him or her as normal and don’t get freaked out. And perhaps because I’ve been more aware and awake, and perhaps just because of some developmental quirk, Lila hasn’t had a tantrum in a week. I know I haven’t seen the last tantrum, but it’s been wonderful to have my sweet girl back so consistently. Tonight, Lila stopped coloring suddenly and looked up. “You got it!” I beamed at her. In five years, maybe I will redecorate. (Maybe. I kind of like having a house full of messy kids’ art projects.) In the meantime, I’m going to see the crayon drawings that appear around the house as gifts; as teachers to remind me to practice equanimity in the face of the creative force that can’t be reigned in. Also, I will make sure my kids use washable markers and keep my Sharpies in a box on the highest shelf. I just love this. What a gift. I need to break out the crayons. Did you know about her drawing in the kitchen before she mentioned that that one could be erased? Glad that you were able to keep the drawing in her bedroom and keep peace in your house. Just be aware that markers – even the washable kind – don’t come off the walls too well (and require mulitple coats of paint to cover up). Stick with the crayons – the wax comes off fine with enough hot water and soap. Tantrums are kids ways of expressing the emotions that they dont have words for yet. Help them to use their words and just make sure they are safe. They need to have a structure that gives them security but not too strict. Kids needs to know what is acceptable and where. What you did with the wall writing is cool and okay for your home.